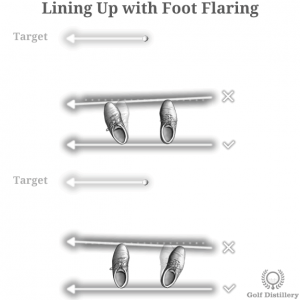 In golf, flaring one’s foot corresponds to angling it out slightly so that the line of the foot is not perpendicular to the target line. This is in contrast to seeing both feet parallel to each other and perpendicular to the target line. You can decide to position your feet likewise or flare either of your feet. The pros and cons of such tweaks are explained below. 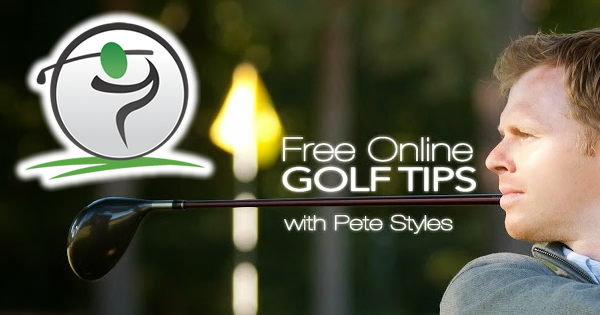 The standard – or default – position in golf involves no foot flaring at all. Indeed, in this situation both feet are aligned so that they are parallel to each other while at the same time perpendicular to the target line. Combined with a decent amount of knee flex, this position provides very good load support and could definitely be considered an athletic position. There are two main advantages to not flaring your feet at all. Firstly, it promotes consistency through the fact that the feet are always positioned the same way. And that same way is very easy to replicate over and over again since a right angle is easier to reproduce than an exact 10 degree angle, for example. 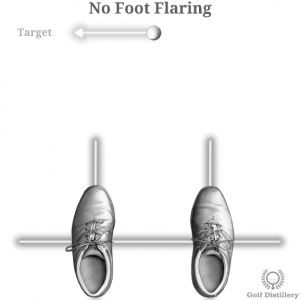 Secondly, it is much easier to align your stance with the target line when the toes are the same distance from the target line. 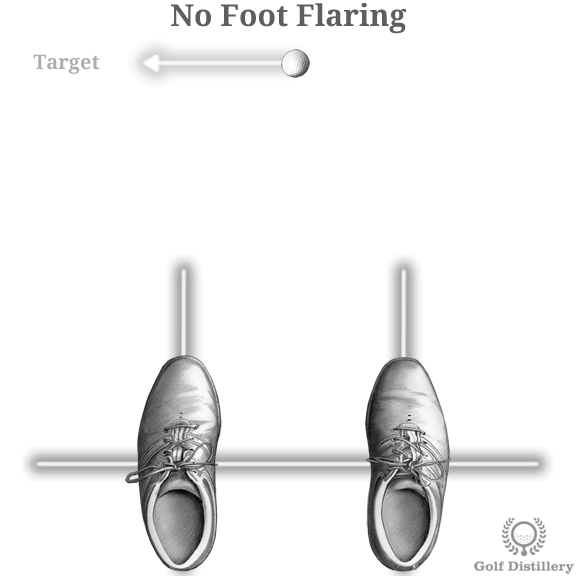 Indeed, flaring your foot tweaks the toe line slightly which can make it more difficult to line up properly for a shot. While that may not be problematic for a square stance, it will become trickier for an open or closed stance that might be required for a certain shot shape. This is why it is generally recommended to align your stance using your heels rather than your toes when setting up for a shot using flared feet. The main negative to not flaring your feet at all is that is may constrain your swing amplitude. This is especially true for golfers with flexibility issues. Indeed, senior golfers or those with certain lower body injuries may be unable to perform a golf swing properly unless their stance allows for foot flaring. 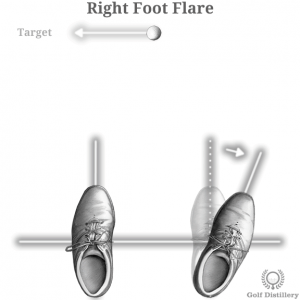 Flaring your left foot involves rotating your left leg out so that your toes are angled slightly to the left. Or in other words, instead of pointing straight forward, your left foot is positioned so that it points to the left slightly. This foot positioning method was promoted by Ben Hogan in his bestselling “Five Lessons” book. 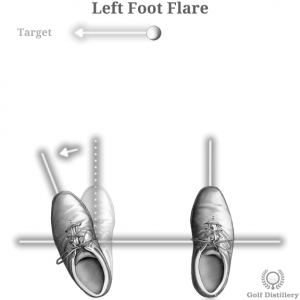 While it does not necessarily do this on its own, flaring your left foot tends to rotate your hips slightly towards the target. This in turn will lead to an outside-to-in swing path that will promote a fade, or at least one with left-to-right sidespin. By opening the left foot slightly you are in effect making more room for the body rotation to occur past the moment of impact. This in turn will lead to a fuller – and easier to perform – follow through. On the flip side, since more room for the follow through has been created, it has happened at the expense of room available for the body’s rotation back. Consequently, the backswing is somewhat reduced in the amplitude it is allowed to comfortably operate in. It is therefore not recommended to flare your left foot if you are looking to increase the width of your backswing or if you suffer from stiffness that limit your backswing already. 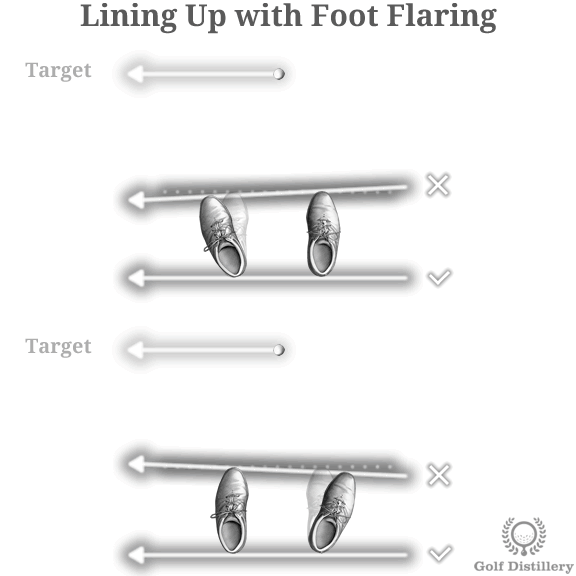 Flaring your right foot involves angling it out. Or in other words it involves rotating your right foot to the right a little so that your foot is no longer pointing directly forward but rather to the right slightly. Similarly to the left foot flare, adopting a right foot flare tends to change the angle of the hips slightly. In this case, it tends to close the hip line in relation to the target line. This has for consequence that it favours an inside-to-out swing path and ultimately to a draw, or at least to a ball with right-to-left sidespin. Flaring the right foot slightly creates more room for the backswing to operate in, and leads to a more comfortable position at the top of the swing. This leads to a fuller backswing amplitude that can help generate more clubhead velocity and ultimately to more distance. 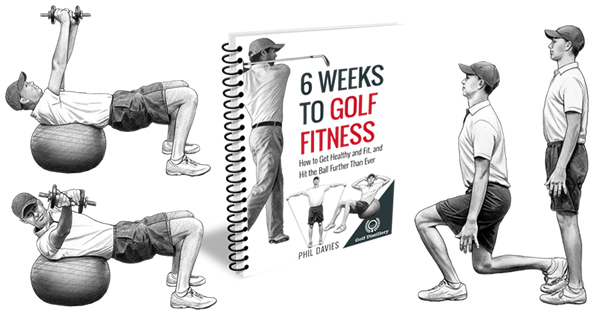 This can be particularly helpful to those with flexibility issues that restrict how far back they can turn their hips and shoulders and ultimately their club. On the flip side, creating more room for the backswing is achieved at the cost of room available for the follow through. 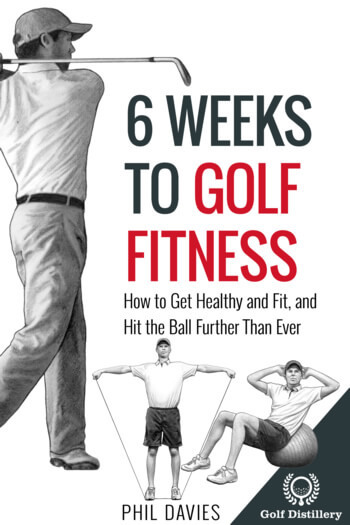 So while you are gaining in how far you can comfortably bring the club back and up you are forfeiting some of the benefits to a wide and full follow through. 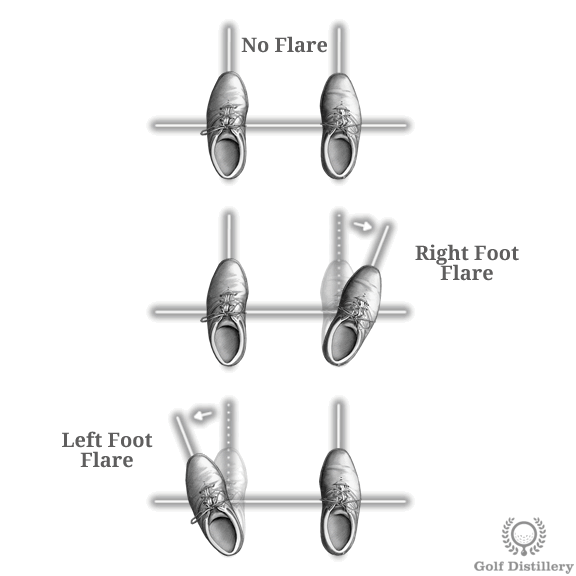 As we’ve seen flaring your left or right foot – or not flaring them at all – has its own set of advantages and disadvantages. While golfing greats such as Ben Hogan made it clear he thought the left foot should be flared, it can be useful to experiment with each permutation in order to determine what works best for your own scenario, taking into account what you are trying to achieve and whether you have physical restrictions that warrant one scenario over the other.